I will post some of my ideas and recipes here from time to time on how I make these delicacies. But for starters I would like to submit a video I just watched on making salami the old fashioned way. You can jump to the last of it if you like and see what this guy has done. Interesting. I would be afraid to skip the curing salt and just use regular salt. He says "if it spoils....eff it...just throw it away" lol. He also handles the peppercorn and paprika containers after having his hands in raw meat. I'm am very paranoid and wash my hands constantly to avoid cross contamination. The biggest issue I run into is finding fresh pork fat around here. When I do find it the price is around $3.50 lb. If I buy fully cooked/smoked pork but or shoulder and cut it in with venison it turns rancid in the freezer. When smoked immediately I use curing salts. When freezing I eliminate curing salts. You can tell that he knows what he's doing but it would seem risky to try this method for the inexperienced like me. Maybe you can shed some light on this. It is a grey area when searching internet methods and not having and experienced teacher. I will try to answer your questions as best I can but it will take a while to do it so bare with me if you wish. First many years ago they didn't use potassium or sodium nitrate to preserve meat. Another word for it is saltpeter the same stuff you use in making Black powder. It is also the same thing as what they call tree stump remover. What they did was pack meat like hams or fish in salt and use the salt to cure and dehydrate the meat. They would remove the water logged salt repack with salt and repeat the process. Once the meat is dehydrated enough,(you can tell when no more water comes out) you then smoke the meat at a very low temperature for several days. Most of the folks back then would just let it stay in the smokehouse until they used it. I was raised on this type of cured meat that was done by a Spanish family from Spain (Not Mexico). I went to school with their boy that was the same age as me. One time some of our pigs they were curing when bad and they replaced every bit of it with their own pork. I remember the first time my wife tried this type of bacon and she thought something was wrong with it. Then she just had to have a country cured ham and didn't like it either or the homemade butter from a farm cow. She said how could you eat this stuff? I told her it was an acquired taste and you were either raised on it or you learned to like it. As for spoilage, white mold good green mold bad. I have a separate refrigerator just to keep cheese and meat in to dry age and store. This refrigerator is kept squeaky clean. If you are drying sausage and it becomes slimy and there is no white mold on it through it away. I would suggest a book called Great sausage recipes and meat curing. I have this book and use it as a guideline on what I do. In my opinion and my opinion only I feel the amount of salt is a little heavy but to each his own. Through the years and experience I have learned to do as I need for my own tastes and knowing the meat is safe to eat. As for sanitation the guy was making a video and probably got side tracked. I always keep a sink full of hot soapy water anytime I cook or do anything in the kitchen. One thing to keep in mind is there are no shortcuts in making sausage or curing meat. At least not anything you would want to try either due to food safety or flavor. That is why the Big Name products taste like salt or worse. And the reason I buy locally from well established butcher shops and meat markets. A good friend of mine born in Sicily brought me some hot soppressata that smelled like a wet dog and tasted like heaven. Many of these dry sausages are not cooked they are raw meat that has been cured by way of a fermentation process. You have to be very careful when doing this. I have never done it but know a guy that does. He is retiring and moving to, of all places Italy. 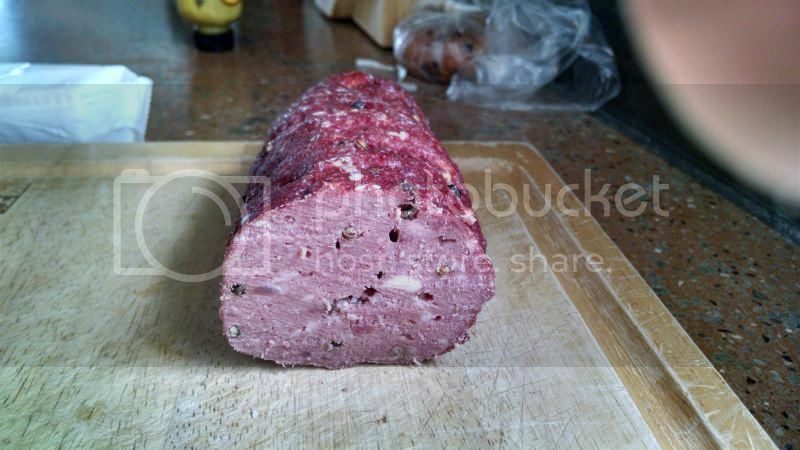 The word cotto in cotto salami means cooked. The word sal in salami means salt. Last edited by Worth1; February 20, 2015 at 01:02 PM. Well if you cant walk the walk then don't talk the talk. I decided to make summer sausage so here it is. I will post pictures first and the come back and give the recipe. Okay I'm back I posted the pictures with my phone and then I am pack on the computer. First it only took about 10 minutes to grind the meat with the hand grinder. The recipe is for 8 to 10 pounds of pork. 3 table spoons of paprika. 2 tea spoons of hot red pepper. 3 heaping table spoons of Mortons Sugar Cure. 1/2 table spoon dry mustard. 2 table spoons of mustard seeds. 3 table spoons of whole black pepper corns. 1 table spoon of fresh coarse ground black pepper. 2 table spoons of onion powder. 1 quarter cup of Yellow tail Cabernet Merlot. Grind the fatty pork with a 1/2 inch grinding plate. Mix the ingredients up by hand into the pork and then I used my KitchenAid mixer with the dough kneading hook. Then a little known secret, they sell a stuffing plate for grinders, i dont have one and dont need one. I simply put the stuffer one without any plate. It works fine, the stuffing funnel gets meat in it and it along with the geometry of the screw/auger in the grinder will keep the contraption forced to the back anyway. Next I let the links hang outside to dry in the wind and then put them in the refrigerator for about 24 hours or so for the meat to cure. An alternate method and best would be to mix the meat up and let set over night and mix again. But I didn't do this and it will cure anyway tonight and tomorrow. Then you have a choice you can smoke them or you can cook them slowly in the oven till the inside temps get to around 145 F.
If you smoke them start at around 120 F hold there for about 6 hours with very little smoke and then raise the temp up to 150 F and smoke heavy till the interman tem gets to 145 F.
(((DO NOT))) let this stuff get too hot or stay at temp too long it will ruin the product by melting out all of the fat. I have seen this all too often with home made sausage and salami like summer sausage. Before you do either use a pin and put a little hole any place you see an air pocket in the sausage and along the sides. PS excuse the mess on the table I have a thousand things going at once. I stopped by the butcher just a bit ago and he didn't have any pork fat. All this talk is making me want to run a batch of something this weekend. I have plenty of frozen ground venison. I cut it with 7% beef suet because it is always available, knocks the sweetness down and helps bind. I make about 100 lbs a year. It doesn't go rancid like pork and is easy to thaw and make sausage for smoking later when I find pork fat. It also replaces burger at my house for any recipe. When I do find fresh pork fat I use it with venison to replace Italian and breakfast sausage at around 20%. I just need to start butchering my own hogs. I agree most recipes are too salty for me. I figure they go overboard to be safe and cover their arse for liability reasons....especially when sold in kits I have experimented with corned venison and pastrami with great results. I just don't feel comfortable with salt cured/aged without guidance. I figured the guy in the video was just doing something out of the ordinary to explain to viewers. It seemed odd that he used fresh garlic also. Sausage in smoker with small stick fire down below. I need to put a smoke box on my chimney. The first picture is from yesterday and the second is from to today after smoking. To continue I pulled them after the temperature got to 152. I then put them in cold running water to stop the temperature from climbing and let them get back down to 88F. You can see the meat thermometer in the last picture. It stayed in the sausage during the entire process. I will let them get cold and will test them then we will see how good they cam out. I'm keeping my fingers crossed I'm as nervous as an expectant father. Last edited by Worth1; February 21, 2015 at 06:42 PM. I hate to brag but I will. This stuff came out just the way I wanted it to. Notice the large fat chunks and how they didn't get melted out. Also the slow cooking temp allowed all of the meat to cook at once not causing a crust on the outer layer. It is pretty hot too. Well there it is from start to finish, now on to the next project. Last edited by Worth1; February 21, 2015 at 07:28 PM. Looks fantastic! Something I could see myself getting into at some point. One question, what do you do with the meat thermometer puncture hole in the sausage? Does that keep it from keeping for a long period? Although if it tastes as good as it looks, a discussion about keeping for a long period is rather pointless. Dang Worth...you may just have a new biz on your hands...or more to do after "retirement". Here is the one with the hole in it all trussed up and ready to go on a trip. What I do is cut them apart remove the string and feathers sticking out. They are cut right back into the very end of the meat. I then role out some Glad Wrap and roll the salami up in it and re-tie everything up all nice and tight and apply more string. They are then dated and put in a freezer that is at -4F below zero for storage. Thanks Zana and the rest of you for looking at my salami making enterprise. Last edited by Worth1; February 23, 2015 at 10:23 AM. Might as well add this to the section too. They are cured pork rib eyes. I cured them yesterday and over night and cooked them today. 1 teaspoon of dried mustard. Mix the dry ingredients and totally cover the 3 pieces of meat about 3/4 a pound in the mix and put in a covered bowl fin the refrigerator or about 14 hours. Take out and rinse with cold water put in bowl and let soak in cold water for an hour then repeat this step one more time. Set out and pat dry. Preheat oven to 375 degrees and put some olive oil in the bottom of a cast iron skillet and place the steaks in the skillet after you have rolled them in the oil. sprinkle some brown sugar on the top side and place in the oven. let cook for 30 minutes and then flip over turn the heat up to 450 and put about 4 table spoons of honey on the steaks and let cook for around 15 more minutes. At this time the honey sugar and moisture in the pan should be foaming. Set out and plate, then pour the remaining juices over the steaks. It beats any ham you have ever had. Last edited by Worth1; February 23, 2015 at 03:36 PM. I made a batch of Salami last night. I did a little better on keeping the fat from rendering out. After smoking for 6 hrs I finished in the oven on 175. I pulled it when internal temp reached 152. It is still a little dry because I used 3 lbs of venison to 2 lbs of ground country style ribs. I can bump the fat/pork up but I try to compromise between healthy and not to dry. I just roll into logs and omit casing. Here is why I make my own sausage.